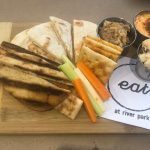 The restaurant called eat at river park is already ranked No. 1 on Yelp for Woodstock restaurants and has 53 5-star reviews on Facebook and seven 5-star reviews on Google. 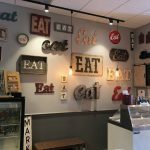 Eat only opened a few months ago in April 2018, and is creating a fantastic following in the community. It is well deserved! It’s even more incredible considering they are only open three days a week, on Thursdays, Fridays, and Saturdays. The owners believe in a balanced life, and raising children while owning and operating a restaurant is hard. Hats off to them for having their priorities straight. Why is eat so popular? Food is presented in a beautiful and unique way, in mini cast iron skillets, on bamboo cutting boards, and in cute little dishes. 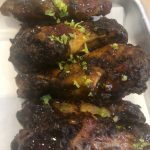 Food is cooked from scratch by a passionate chef and her staff, like the coffee & spice rubbed wings with a sweet heat sauce, house-made creamy pimento cheese, creole red bean hummus, apple & pecan chicken salad, and crispy grits with creole aioli sauce. The locally owned and chef operated restaurant offers one of a kind cuisine in a warm and inviting atmosphere. 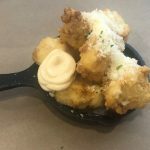 Georgia residents for over a quarter of a century, and Cherokee residents for 18 years, Chef Mo’s Louisiana heritage coupled with her husband Jackson’s fondness for southern comfort foods creates one of a kind food offerings. 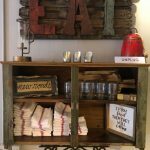 Popular menu items include chicken and waffles, braised short ribs, potato salad, shrimp po boy, and incredible homemade desserts like Louisiana pralines “pecan candy”, glazed doughnut bread pudding with a vanilla-rum sauce, and peach waffles foster with a scoop of brown shugah vanilla ice cream. The ‘Grab and Geaux’ cooler features ready to go take home meals like shrimp and grits and shepherd’s pies. Calling ahead ensures they have what you want, whether it is for dinner tonight or for a friend who just had a baby, or even to take to a potluck. Just give them a call at 678-403-2178. In a few weeks, eat will offer local delivery via contacting them directly, as well as via Grubhub’s app for easy ordering and delivery. 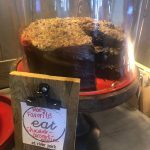 Eat also offers private events, catering, and a little bites menu for children aged 10 and under. 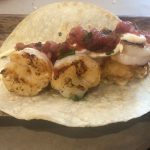 Tucked into the River Park neighborhood on old Hwy 5, just south of the I-575 Sixes Road exit, eat at River Park is just 3 miles north of downtown Woodstock. Eat is located at 1700 River Park Boulevard, Woodstock, in unit 103. The restaurant is open on Thursdays, Fridays and Saturdays for lunch and dinner. Follow eat on their Facebook page and visit them for a great experience on Thursdays 11-2 and 5-9, Fridays 11-2 and 5-10, and Saturdays 11-3 and 4-10. 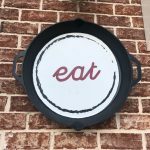 If you eat at eat, let us know about your experience!